LIVEN UP YOUR WARDROBE WITH OUR COBRA PRINT! The days of bland, norm-core looks dominating fashion are OVER! The simple & boring has been swapped out for the invigorating: prints, shimmer, mesh panels, and more make it clear that having fun with your clothes is once again en vogue. Animal prints are experiencing a welcomed return, and we have Snakeskin Cobra available in a Legging AND Racerback Sports Bra! Part of the print’s magic lies in its ability to be both snazzy & sophisticated, a guaranteed way to inject star-power into any fit. Our Cobra Racer Back Sport Bra features a built in mesh liner for trusted support. Classic racer straps, and form perfecting Nylon/Poly/Spandex make this sport bra fit like a glove. 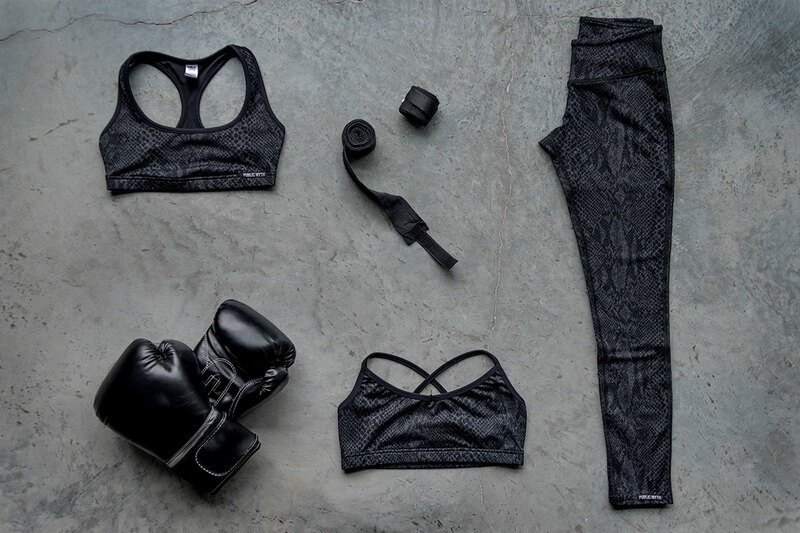 Pair the bra with our Cobra Leggings and top the fashion scale. Public Myth’s breathable material and signature utility pocket add functional appeal. Avoid any cutting in at the waist with the new compression fabric waistband! As well, a slightly higher rise creates a more seamless & flattering look!! Shop the Cobra Racerback Sports and Cobra Leggings!